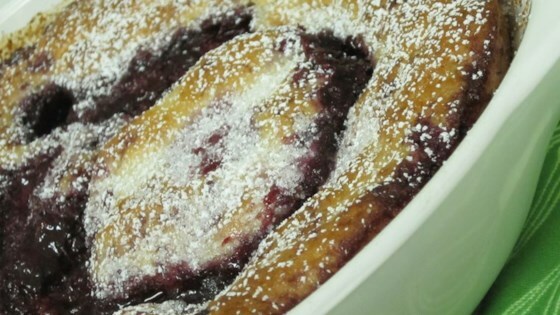 "Delicious cobbler made with fresh or thawed berries." Preheat an oven to 375 degrees F (190 degrees C). Grease a 9x9-inch baking dish. Whisk the milk, oil, 1/3 cup sugar, and baking mix together in a bowl until no large lumps remain. Pour into the prepared baking dish. Whisk 2/3 cup sugar with the water in a clean bowl until mixed. Gently fold in the berries until evenly coated. Spread the berries over the baking mix batter. Bake in the preheated oven 45 minutes. It might seem like a lot of water but when mixed with the berries and sugar, it turns into a syrup and once cooked, it basically turns into a jelly. If using canned or frozen sweetened fruit, omit the sugar and use juice instead of water. Good but very sweet. My son loved it but I like to have a tiny bit of tartness in a berry filling. I will make again and maybe add a little lemon juice to the berries/sugar mixture. I'm no baker and even I can make this. It's delicious and really impressed my family.